A. Yes, provided you are working in Japan with proper VISA. PNB's “Own a Philippine Home” Loan is designed to help you refinance your existing Peso mortgages. Refinancing through PNB's program will usually result in a lower interest rate and lower monthly installments. Q. I bought a lot when I was still single. I am now married and want to build a house on that lot. Can I apply for a loan without informing my husband? A. No, both spouses would need to sign on the loan documents. Q. I am Filipino but my spouse is a foreigner. Are we eligible to purchase property with your loan program? A. Yes, however, under Section 7, Article XII of the Philippine Constitution, foreigners may not acquire private land. As such, the title of the property will be in the name of the Filipino spouse only. Q. If I am a temporary worker in Japan with proper VISA, can I purchase property under your program? A. The answer to this shall be determined on a case-to-case basis, depending on the prospective stability of Japan employment, the current and future assets of the borrower and other factors. In general, this program was created for those Filipinos and foreigners who have valid working visas and wish to buy Philippine real estate. It is this stable stream of future income, which the bank looks into as primary source of repayment of the loan. Q. If I am a former Filipino and now have become a Citizen of another country (e.g. Japan), what kind of property may I purchase under your program? A. Former Filipino citizens are entitled to purchase private real estate (i.e. house and lot) up to a maximum area of 1,000 square meters. Foreigners are entitled only to purchase condominium properties wherein the Condominium Corporation owns the Common Areas. Q. May I borrow to pay for the 30% down payment on the property? A. No, the cost of the downpayment must be borne by the borrower. The bank will finance 80% of the appraised value of the property. Minimum allowable loan amount for LOT only projects is Php500,000 and Php1,000,000 for House and Lot Projects. Q. How long will PNB Tokyo process my loan application after submission? A. If all requirements are completed and submitted to the bank, it will take an average of 3 months to process the loan application. PNB Tokyo branch are able to check and validate with the Registry of Deeds and other government offices the status and appraisal value of your property in the Philippines. PNB Tokyo branch will require the seller/developer to transfer the ownership of your title prior to the release of loan. 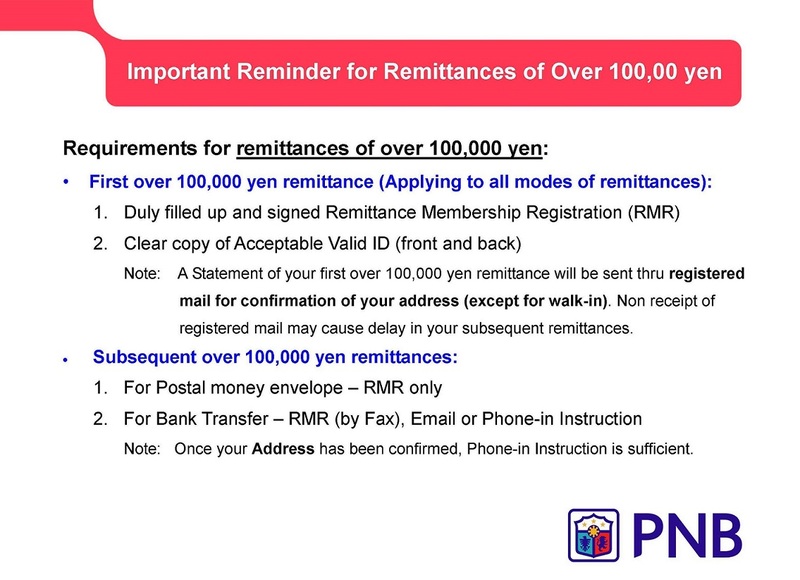 There is no need for you to remit your payment to the Philippines for the monthly amortization because your payments will be made to PNB Tokyo directly. Thus, eliminating additional expenses such as remittance charges.